Now is the perfect time to revamp your interiors with some great new decor from Weekends Only Furniture & Mattress. This high-quality furniture store, with locations near St. Louis and Indianapolis, is celebrating the season of autumn with gorgeous furniture and home decor that showcases rich textures and classic fall colors, like gray, green, metallic, orange, and plum. If you want to add a little fall flair to your living room furniture, swap out your old standbys for a few well-chosen accent pieces. 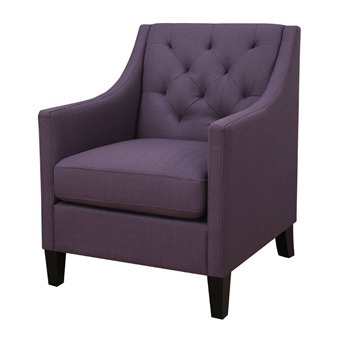 The stunning Francis Eggplant Purple Tufted Back Armchair is the perfect addition to any living room furniture set, and plum is one of the hottest colors of the fall season. For a cohesive theme, you can continue the touches of plum throughout your home with hanging wall art and light-hued bedroom furniture. Green is another popular choice for home decor this season, and you can mix and match varying shades for an eclectic yet stylish look. And Weekends Only Furniture & Mattress makes decorating your home in green easy: If you want to add a verdant dash to your living room furniture setup, all you need to do is snag a fabulous little rug, an accent lamp or two, and maybe a few pieces of art. Small touches of stylish colors are a great way to transform a room without breaking the bank. Looking for more earthy tones for your home decor? Classic living room furniture like Weekends Only Furniture & Mattress’ lovely distressed gray consul, rust-colored ottoman, and silver-topped end tables will cozy up your home just in time for the holidays. Plus, their truly stunning bedroom furniture sets in rustic autumn brown will go perfectly with their array of area rugs in vibrant orange, leafy gold, and mossy green. Mix, match, and celebrate the beauty of the season your way with stylish home decor from Weekends Only Furniture & Mattress. Start shopping online now, stop by one of their conveniently located showrooms, or give them a call at (314) 737-4062.